It uses only one pan which makes clean up a breeze. It’s not expensive to make which is easy on my pocket. There’s also not a lot of ingredients which makes cooking it and shopping for it less time consuming. It makes the BEST leftovers which can be frozen, eaten for lunch, or heated up for another dinner. It’s a clean plate club dinner every time. Yes, even the Brussels sprouts. It’s allergy free for us which means no dairy, soy, egg, nuts, legumes, carrots, garlic, banana, barley or pork. Don’t be scared to try this because it’s allergy-free, it also uses WHOLE foods and is very healthy! Grease large baking pan with Extra Virgin Olive Oil (enough to coat the bottom of the pan). Peel all dark colored leaves off the outside of the Brussels sprouts. Cut each stem off (be careful not to cut too close so that all of the leaves fall off, just cut the dried up part). 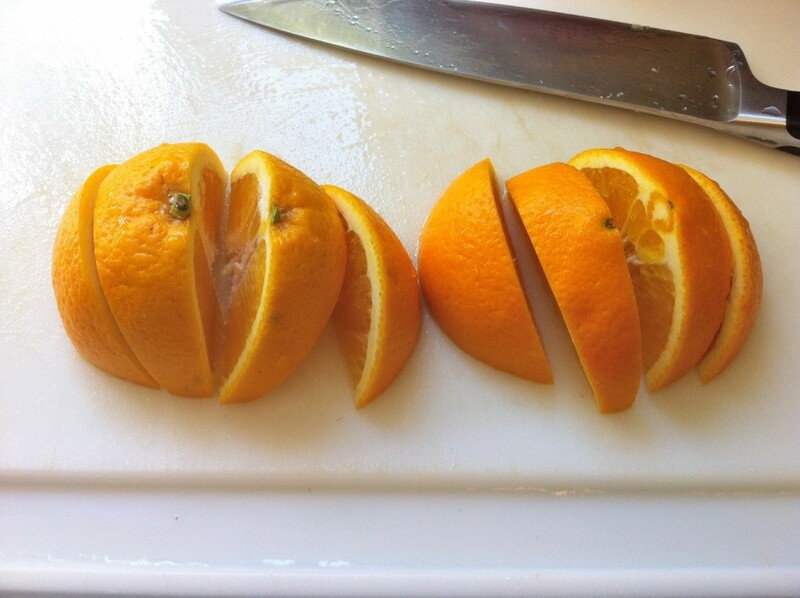 Slice each one in half, length-wise. Rinse all Brussels sprouts and put in oiled pan. 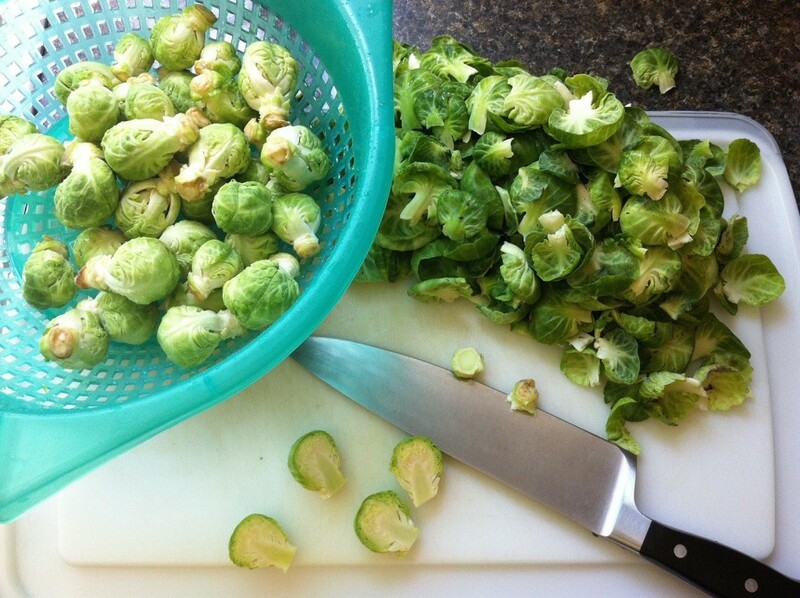 Preparing Brussels Sprouts for an allergy free meal. 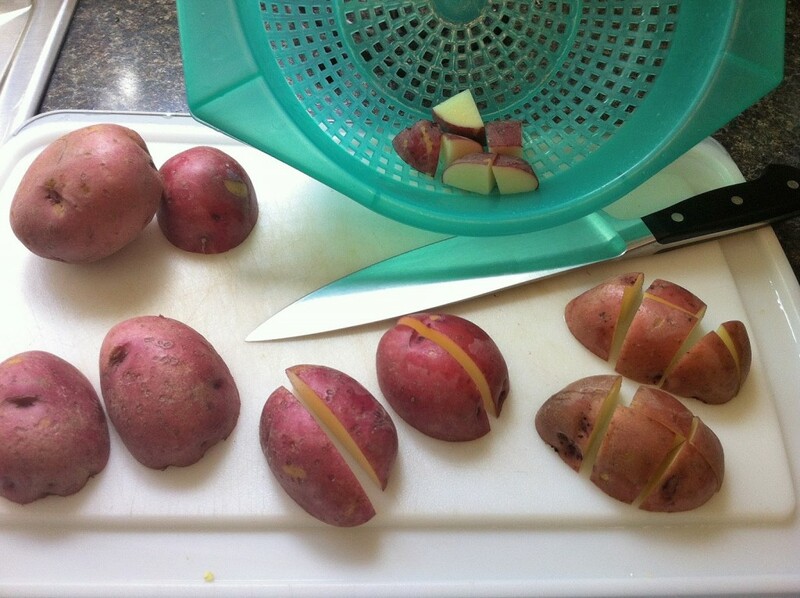 Slice each potato in half, length-wise. Quarter each half of the potato (like shown in picture). 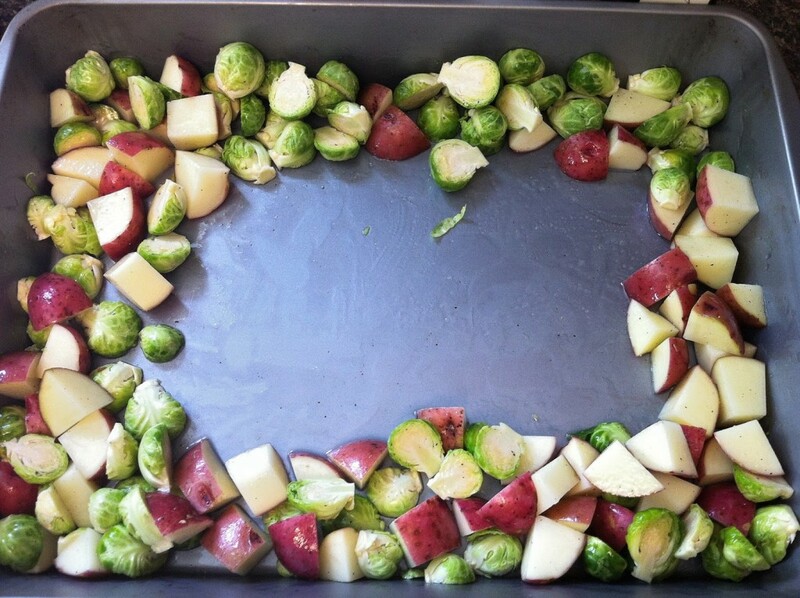 Rinse cubed potatoes again and put in oiled pan with Brussels sprouts. Sprinkle with salt and pepper and stir to evenly coat pieces with oil. 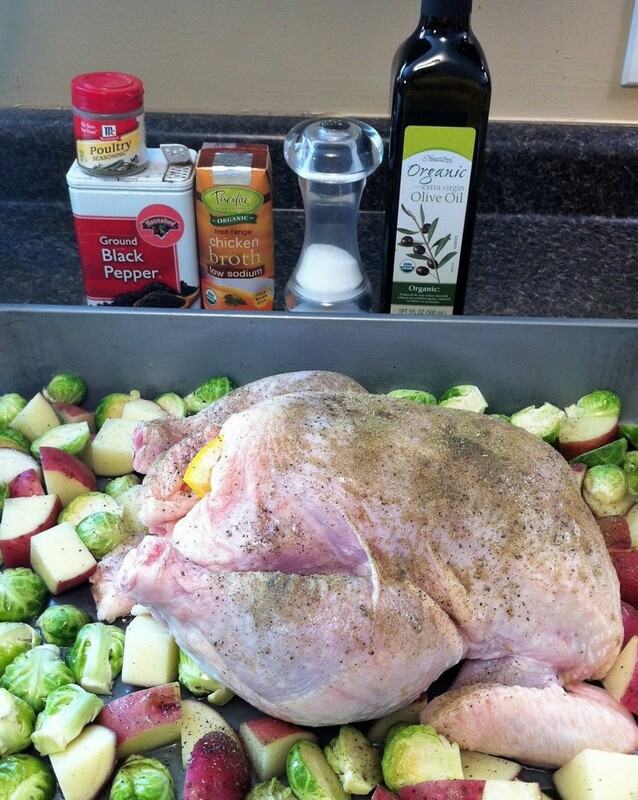 Push potatoes and Brussels sprouts to outside of pan leaving a spot in the middle for the chicken. Make room for the chicken! Quarter orange and set aside to stuff inside the chicken. Sliced oranges release juices while cooking which makes your chicken SUPER juicy! Place chicken in oiled pan. Stuff the chicken with the orange slices. (I’ve also used apples, pears, and lemons). Oil the outside of the chicken and sprinkle with salt, pepper, and poultry seasoning. Empty one small container of Chicken Broth into the pan (not on top of the chicken). Stuff that chicken with oranges, lemons, pears, or apples. YUM! Simple ingredients, delicious meal, happy and healthy family. Roast in oven for 20 minutes at 450 degrees. Decrease temperature to 350 degrees and cook until internal temp is at 180 degrees (taken in the thigh). If you don’t have a meat thermometer, try cooking for about 20 minute per pound or when juices run clear. Remove chicken to a large cutting board and allow to sit for 15 minutes. Increase temp to 425 degrees and put the pan with veggies back in while chicken rests (we like them crispy). DON’T FORGET THE VEGGIES! Make sure to use a timer and remove veggies after 15 minutes. Carve your chicken and ENJOY! Our roasted chicken dinners wouldn’t be complete without cranberry sauce. Yum! Did you try this recipe? Please feel free to comment below or on the facebook page and tell me how you enjoyed it! Do you have a suggestion, then please share!!! This will feed a family of four WITH leftovers!!! 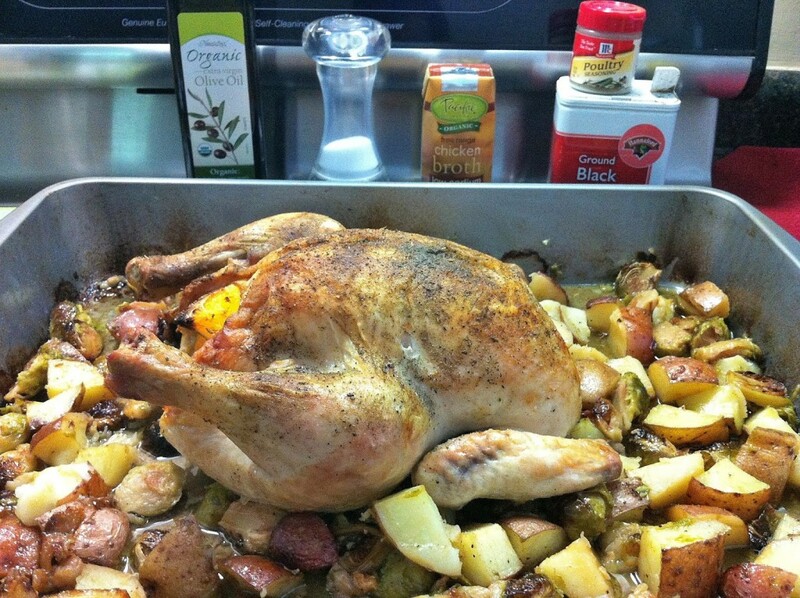 What to do with roasted chicken leftovers? Make allergy-free chicken soup!!! « Free EpiPen® For Schools!